In spite of a lingering gastric malady that had us planning to sneak out during intermission, we were so hooked on the idiocy being presented on stage that the proverbial wild horses couldn’t get us to leave before final curtain. From the ludicrous and non-intrinsic opening number to the final sing-along, Spamalot is full measure entertainment. Such bits as on-stage disagreements between cast; crew and director may be an aspect of uncooperative rehearsals, in this instance, they’re hilarious and seem almost improvisational- a sign of impeccable direction by Bob Riddell. Also wearing the choreographer’s hat, Riddell has somehow managed to imbue his charges with an obvious sense of élan & joie-de-vivre that is reflected in every solo, duet or chorus number by everyone on stage. The actual plot begins with King Arthur & his servant approaching a castle. The gatekeepers indulge in an intellectually pedantic discourse about the relationship between genus passeridae & cocos nucifera, that is worthy of a Sheldon Cooper/Leonard Hofstadter diatribe! The scene and chorus number about carting away corpses may be tasteless but the laughter it gleans shows that we all suffer from a weird sense of humour. [BTW, the rhyme “Ring around a rosie” refers to that very thing]. Every cast member contributes full measure of their talent and attachment they obviously feel for this production, but there are some notable standouts. Among the lead roles, Maria De Palma’s Lady of the Lake is a vocal powerhouse but also an innate comedian with an artist’s sense of timing and body language. In four diverse roles, Martin van Helden is terrific. Another multi-role interpreter is David Grimason. The pivotal role of Arthur’s manservant is played by Kirk De Palma and he’s a shoo-in if he ever auditions for ‘La Mancha’s Sancho Panza’. One of the ensembles who possesses a constant 1,000watt smile is Jessica Callaghan and if she can sing as well as she dances; she’s surefire star material. 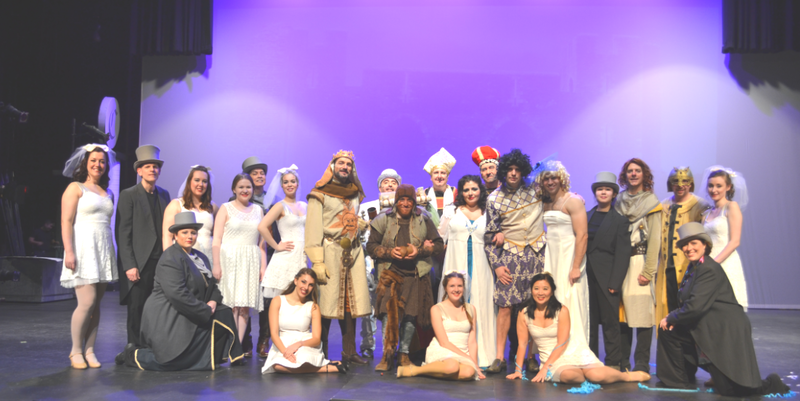 SPAMALOT runs until Jan. 31st at the Meadowvale Theatre. Do yourself a favor; see the play; don’t be offended by any of the P.I. episodes (we cackled at the Jewish shtick, and we both ARE); and DO tell your friends about this super offering. F.Y.I. the actual location of Camelot is really 36o. 1215N; 115 o. 1759W – check it out!